Arsenal fans are a happy bunch right now as they line up with a very attack-minded team for the big game against Manchester United today. The Gunners have gone with Mesut Ozil, Aaron Ramsey, Pierre-Emerick Aubameyang and Alexandre Lacazette all in the same starting line up to take on the Red Devils. This is certainly bold from Unai Emery, who hasn’t even made a regular habit of handing starts to Ozil and Ramsey for most of this season, much to the bafflement of many Arsenal fans and pundits alike. 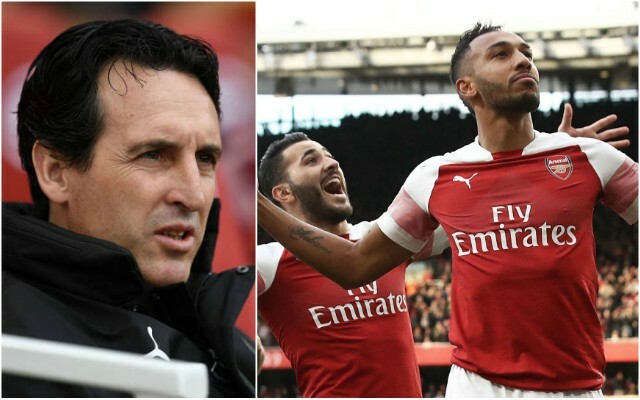 Both strikers Aubameyang and Lacazette is also a big call in this big game, with the Spanish tactician perhaps understanding that his best hopes of a victory today would come from outscoring Man Utd. Ole Gunnar Solskjaer’s side are in better form going into this game, though they haven’t been particularly solid at the back since the Norwegian tactician took over at Old Trafford. Ozil, Laca and Auba all starting! Ramsey, Ozil, Lacazette, Aubameyang all in one team ?? Emery is doing what i've begged of him for months… show some guts.